The first finished object for this year, with photos taken with the first of this season’s tomato crop during the first heatwave for the year. 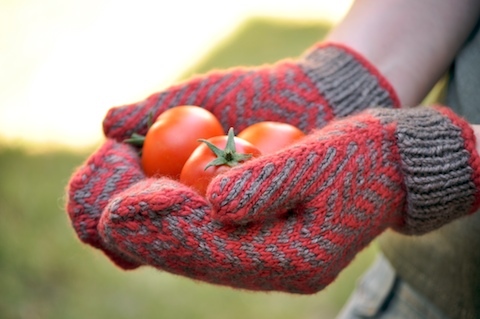 To anyone who saw the photos being taken today, they must have wondered what on earth that girl was doing, wearing mittens and toting tomatoes when it’s hot outside. These photos make up for any slippage in our standing around the neighbourhood, right? 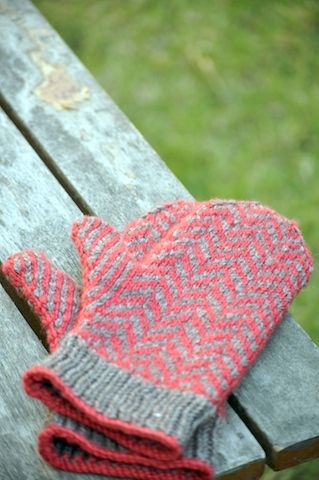 Given the weather, it might be surprising to know these mittens were borne out of necessity. It seems I don’t have that much in the way of proper winter clothes, an issue that will become most apparent when we’re in Japan next month (!!!). The mittens, while not solving all the winter wardrobe deficiencies, will hopefully keep the winter chill off my fingers somewhat. It pleases me greatly that the mittens were made from yarn left over from other projects. I was concerned about whether I’d have enough yarn for the mittens, and whether the yarns would go together, but both concerns were completely ill-founded. There is still some Malabrigo left, and the yarns worked up together really well. Using the Malabrigo at the edge of the cuff might not have been the wisest choice, as I suspect it’ll pill or even felt a bit. There’s been a noticeable slow down in knitting on account of the warmer weather. So much so that it took a concerted effort to get the thumbs finished and ends woven in and I’ve been contemplating doing some sewing instead of knitting. The horror! They are geat mitten! Perfect for Japan. Hope you enjoy some sewing time! they’re gorgeous. I must have some. And they’ll be perfect in Japan! These are gorgeous. Yay for toasty fingers. Lovely lovely mittens! Those colours look so nice together – I would never have thought to pair that lovely browny yarn with red of my own accord, so it is great to see how well it works. Japan – how exciting! I’ve wanted to go there for so long.